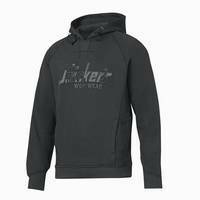 Camouflaged comfort, a high-quality Snickers FlexiWork Hoodie with adjustable drawstring in the hood. Count on three-thread fabric comfort and patented MultiPockets� convenience. Features patented MultiPockets�, two smart side pockets, perfect for a mobile phone or glasses. With inside Guided Wire System protecting your audio cables. Material: Comfort, durable fabric in 80% Cotton 20% Polyester, 330 g/m�.